It’s the holiday season. Snow is falling making the roads slippery, holiday shopping is in full swing and dinnertime seems to sneak up on me. When making supper for my family, I have three rules on weeknights: it must be easy, it must be quick and most important: it must have dairy. One of my family’s favorite savory fall and winter go-to quick meals is sausage and butternut squash. It healthy and pairs well with a garden salad for a knockout combination. Is your mouth watering yet? For this recipe you will need one pound of ground sausage (any seasoning you prefer, I usually use breakfast ground sausage), one ripe butternut squash, one cup of shredded Heritage Ridge Creamery Monterey Jack cheese, a half cup of Heritage Ridge Creamery Cheddar cheese, a quarter cup of real MMPA rolled butter, and a half cup of sour cream. This recipe will serve 4-6 people. I love using my cast iron skillet. It is naturally nonstick, and I think there is a unique flavor added from using it but using any type of skillet will work for this recipe. To start, peel the butternut squash and slice in quarter inch slices then set aside. Next, brown one pound of ground sausage in your skillet. When the sausage is thoroughly cooked, remove from it from the skillet and place it on a paper towel covered plate to drain the excess fat. Melt the butter in the skillet on medium heat. If you still have some drippings from the sausage in the pan, it’s ok because it will just mix with the butter and help enhance the flavor. Place the butternut squash slices in the melted butter. Cook in the skillet and turning when cooked about half way through, about seven minutes. The squash will be fork-tender when done and brown and crispy on the outside, soft inside. After the sausage and squash are cooked, it is time to put everything together on plates. 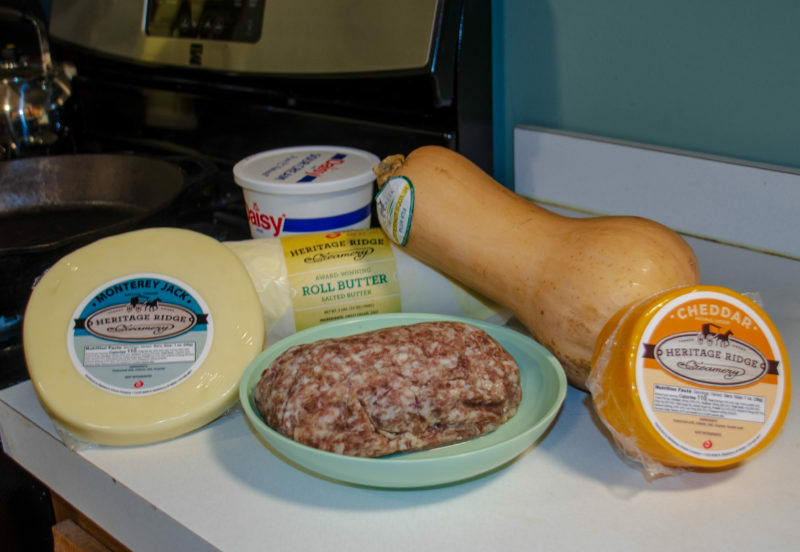 Place two squash slice on the plate, cover with one-fourth cup sausage and sprinkle with Monterey Jack and Cheddar cheese. Add a dollop of sour cream to the side of the covered squash slice. Enjoy! 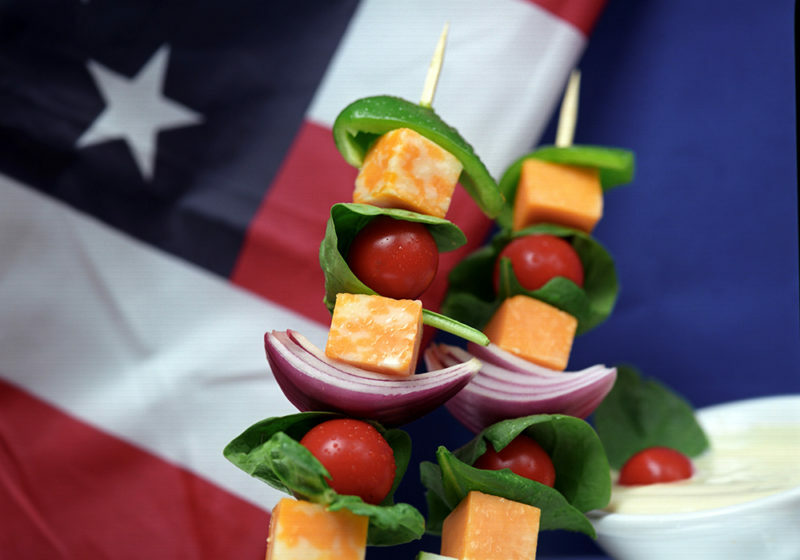 Alternate vegetables and cheese cubes on skewer. To create the salad, use leaf lettuce or spinach leaves and ribbon around vegetables. Stir all ingredients together until well blended. Store in refrigerator until ready to serve. Dip and enjoy! In a small bowl, combine the yogurt, cilantro, scallions and lime juice. Add salt to taste. Set aside for at least an hour to allow flavors to meld. Will keep 3 to 4 days in refrigerator. 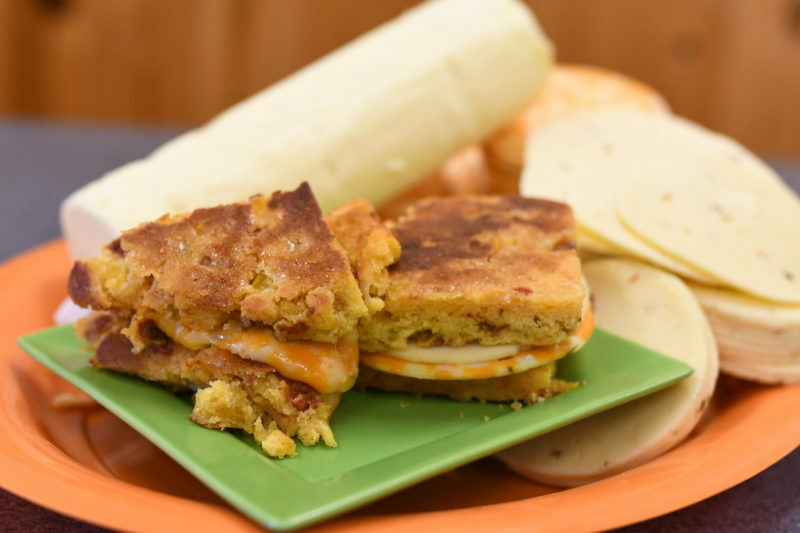 Celebrate National Grilled Cheese Day with this three-cheese classic! Today is National Grilled Cheese Day — a day that surely can’t be missed at the Heritage Ridge Creamery. 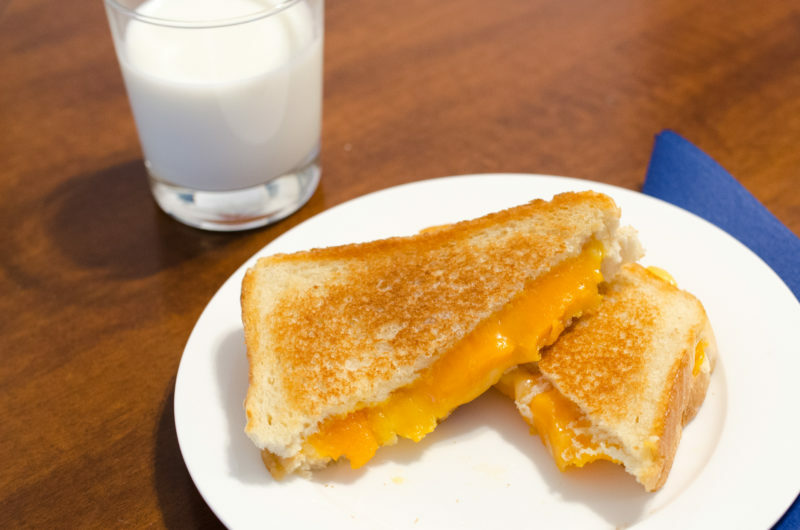 Whether you’re making a classic cheese & bread combo or throwing in something extra special like apples or rosemary sprigs, there’s nothing like enjoying a warm grilled cheese sandwich paired with tomato soup or an ice cold glass of milk. The varieties of grilled cheeses are endless, but here’s a classic three cheese option made from some of the favorite Heritage Ridge Creamery cheeses. Place a non-stick skillet over medium heat. Butter two slices of the bread and assemble cheese inside the sandwich, butter side out. Place the sandwich on the skillet and grilled 3-4 minutes until golden. Flip the sandwich with a spatula and grill the other side for an additional 3-4 minutes. Remove from heat, slice in half. Preheat oven to 400 degrees Fahrenheit. Line a baking sheet with parchment paper. Cut ends from tomatoes and slice each tomato into 4 wedges. Place tomato and onion wedges on parchment. Brush with 1 teaspoon of the olive oil. Bake 20 minutes or until edges of onion are lightly browned; set aside. Reduce oven temperature to 375 degrees Fahrenheit. Unroll pie crust on baking sheet. Spread mustard over crust. Sprinkle cheese over mustard, allowing 1-inch border around crust without cheese. Remove about 1/2 of the onion wedges from baking sheet and set aside. Arrange remaining onion and roasted tomato over cheese. Fold 1-inch border up over tart edge. Bake for 25 minutes or until pastry crust is browned and cheese is melted. Sprinkle tart with thyme leaves and allow to cool at least 10 minutes before cutting. Whisk together remaining 2 teaspoons olive oil, 1 teaspoon mustard, orange juice, vinegar and salt and pepper in a small bowl. Toss dressing with salad mix and remaining onion. 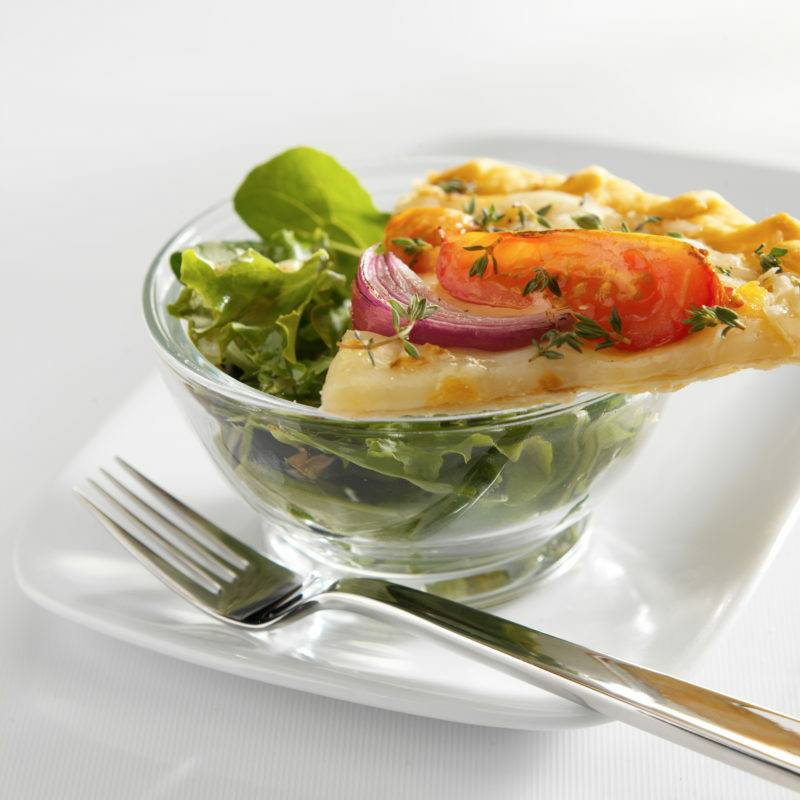 Cut tart into wedges and serve with salad. 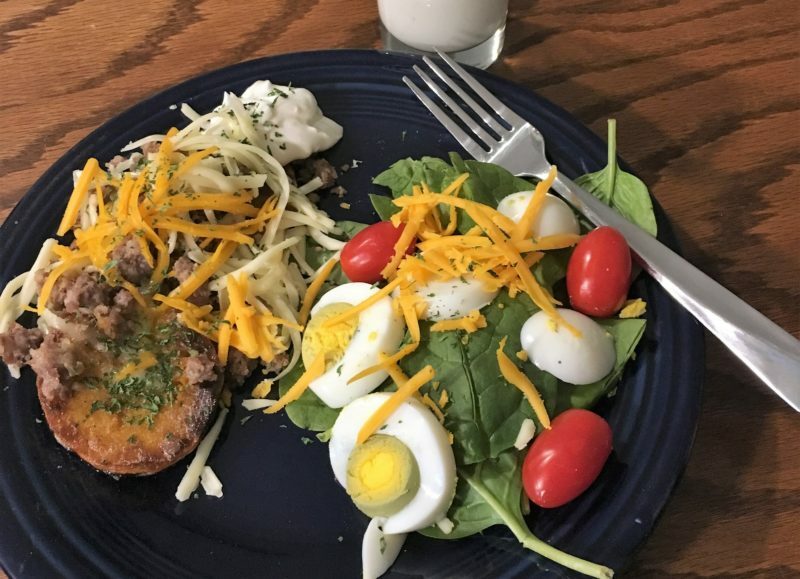 Yield: 1/6 of tart plus about 3/4 cups of salad and 1/2 tablespoon of dressing, per serving. Preheat oven to 350°F. Coat a 10-inch oven-safe skillet with cooking spray. Combine all ingredients in a large bowl; stir until combined. 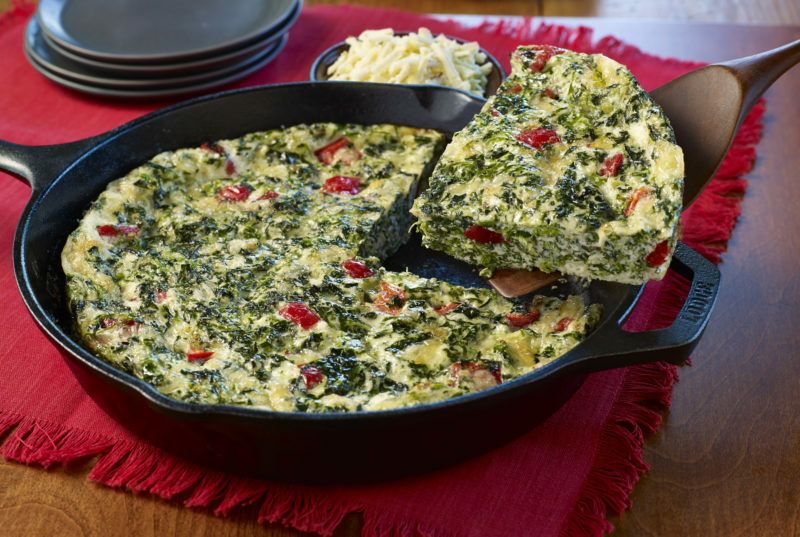 Pour egg mixture into prepared skillet; bake for 15 to 18 minutes or until eggs are set. Remove from oven and let stand for 5 to 7 minutes; slice into 4 wedges and serve. Tip: Experiment with other vegetable add-ins; try chopped and roasted root vegetables or Brussels sprouts.